Let’s start this out by saying I in no way believe that it is actually possible to entertain kids at a restaurant. Majority of the time restaurants with kids is just miserable, but we can certainly try. We can’t hide in our homes eating our terrible cooking forever. Plus it’s nice to have someone clean up after a meal every now and then and that person isn’t you. Here are a few toys and tricks I suggest for keeping those little terrors somewhat quiet long enough for you to eat half of your meal and a few sips of wine. 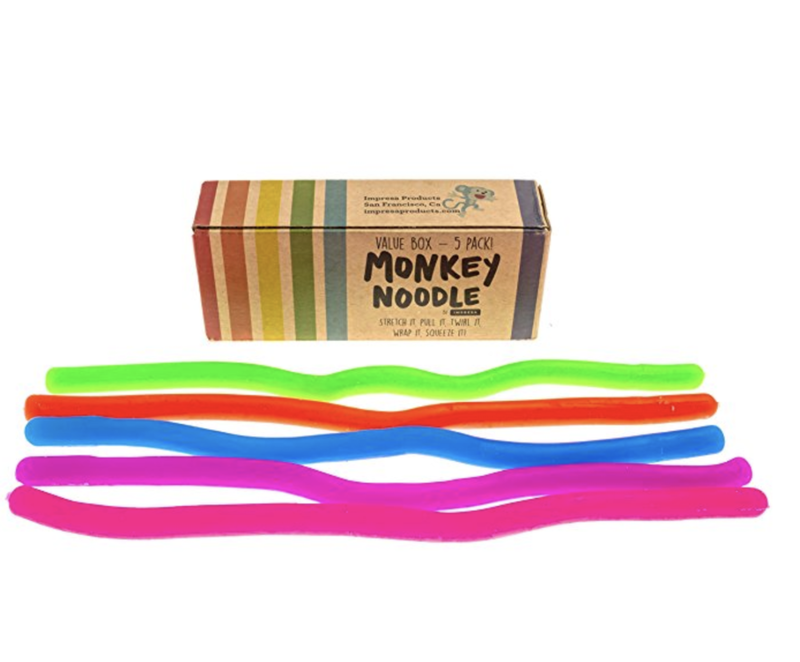 These monkey noodles are great they are soft, stretchy sort of fidget toys. They twist, turn and the bright colors are fun. They’re really is no special light or sound or anything with pizzaz- they’re super simple and sometimes simple works best. This essentially is bubble wrap for kids. Perhaps it also provides the same satisfaction that popping pimples does for some people. This toy is a little big but a perfect one to work on some good old hand and eye coordination. My son has zero patience sometimes- so much so many toys he can’t figure out get tossed across the room at a dangerous speed, but he seems to really like this one. If it can entertain him, it can entertain anyone. I was a biiiiiiiiiig time rainbow art scratch off paper when I was younger so I was so excited when I saw this. I thought great I’ll write love notes to my husband and then I quickly decide he didn’t read them and I should probably just let my rainbow loving daughter have them. They’re perfect to throw in your purse and pull out for a dicey moment at the restaurant. What do you use to keep your kids busy at a restaurant?